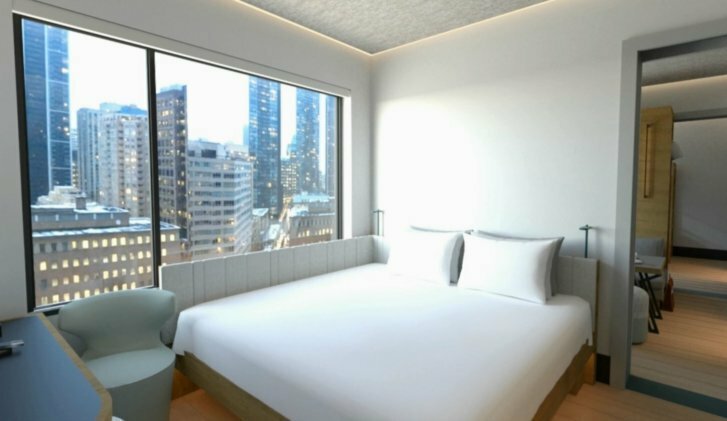 WASHINGTON — Hilton’s newest hotel brand is called Motto by Hilton with tiny, multipurpose rooms designed to cater to budget-minded travelers who still want to travel to the most popular cities. Hilton says Motto is a micro-hotel with an urban vibe in prime global locations. Washington, D.C. will be among the first markets for a Motto hotel opening. Hilton developed the new brand after extensive market research that found a growing segment of travelers who want reasonably priced, less traditional hotels in central locations. Guest rooms at Motto will average just 163 square feet, but will include space-saving features like wall-beds, loft beds, segmented shower and toilet stalled and multifunctional furniture that can be stowed away when not in use. The rooms will also have Hilton’s Connected Room technology that allows guests to use the Hilton Honors app on their smartphones to control temperature, lighting, TV and window coverings. Motto is also designed for people who travel with friends, or are looking for temporary housing options in urban markets. Each hotel will allow guests to split payments between more than one person at the time of booking. They will also allow guests to book multiple connecting rooms in advance. Hilton will open a 100-bed Motto in Marylebone, London in 2020. Other early markets will include urban locations in D.C., San Diego, Boston, Savannah, Dublin and Lima, though Hilton did not identify the exact locations.